Over the last week, two press releases from two different groups have revealed both the hottest and coolest known stars in the sky. We'll start with the new hottest known star, discovered by astronomy Klaus Werner and collaborators with the FUSE ultraviolet telescope. At a whopping 360,000 degrees Fahrenheit (200,000 Kelvin), this star is dang hot. The star, with the exciting (NOT!) 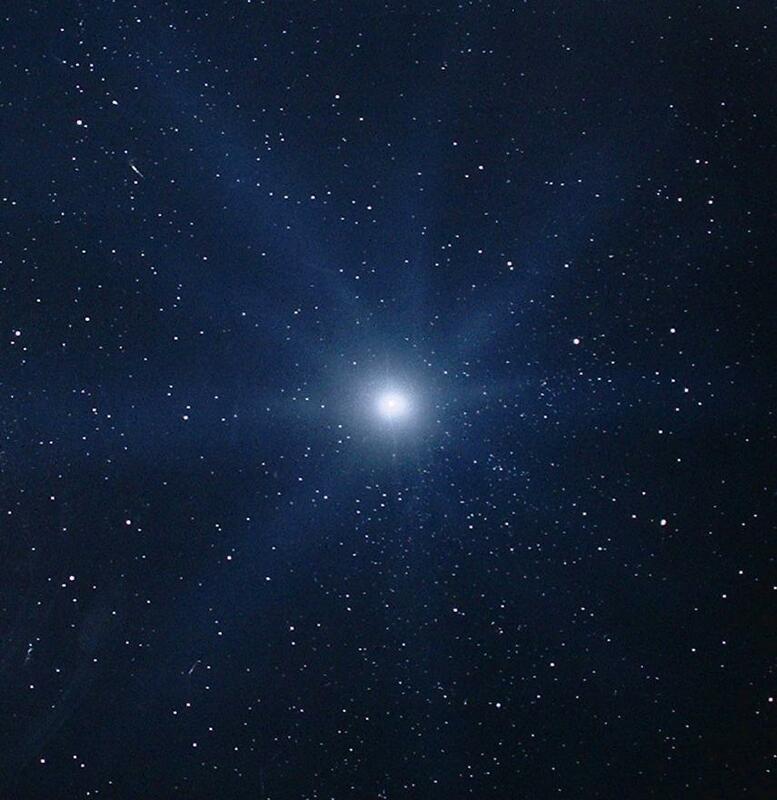 name of KPD 0005+5106, is a white dwarf, or the ashes of a dead star. Until very recently, this white dwarf was a fusion nuclear reactor at the center of a star. But the star used up all of its fuel, and its outer layers blew away in a planetary nebula, revealing the super-hot nuclear engine. While there are lots of white dwarfs known, very few of them are super-hot like KPD 0005+5106. This is because white dwarfs, without any nuclear power left, cool off very quickly at first. In "only" 300,000 years (short by astronomy terms), the white dwarf will cool from hundreds of millions of degrees to under 100,000 degrees. Most white dwarfs we see are hundreds of millions of years old, and are a relatively modest 10,000-20,000 degrees in temperature. So, the fact that KPD 0005+5106 is so friggin' hot means that it is very young, just recently emerged from the center of its dying parent star. More than likely, there are even hotter stars waiting to be found, if we look in the right direction. We white dwarf researchers are looking! If we can find enough really hot stars, we can learn a lot about how a star ends its life, and how the white dwarf emerges from the cocoon of a dying star. We can also learn a bit about exotic physics -- these stars are so hot, they are making copious numbers of subatomic particles called neutrinos. Neutrinos are pretty hard to study, because they could pass through one light-year of lead like nothing was there. But if we can measure how fast these hot stars are cooling off, we can estimate how many neutrinos are escaping into space, which tells us a lot about how these weird particles are made. At the other end of the spectrum, (both literally and figuratively), astronomer Adam Burgasser and his collaborators announced the discovery of the two coolest known stars, a pair of identical twin brown dwarfs. These stars are a chilly 600 degrees Fahrenheit! Granted, we'd feel a bit warm if we got too close to these stars, but compared to our sun (a mild 10,000 degrees Fahrenheit), these are downright cold. Replace our sun with these brown dwarfs, and the Earth would quickly freeze over. Brown dwarfs are sometimes called "failed stars." They are at least 15 times more massive then Jupiter, up to about 80 times the mass of Jupiter. When newly born, brown dwarfs can turn do a few nuclear reactions, but they quickly die out. The star just isn't big enough for gravity to keep its nuclear engine running. So, like the white dwarfs, brown dwarfs slowly cool off and fade away. Only, since brown dwarfs were never more than a few thousand degrees to start with, they get very cold, very quickly. To study brown dwarfs, astronomers need to look at infrared light (what many of us would call "heat" radiation). Using the Spitzer Space Telescope, an infrared light counterpart to Hubble, Burgasser and his team were able to measure the temperature of a brown dwarf called 2MASS J09393548-2448279 (a worse name than KPD 0005+5106!). They then used a telescope in Australia to measure the distance to the star, and they got 17 light-years. That's pretty nearby, in space terms, and one of the five closest known brown dwarfs. But when Burgasser's team compared the amount of light coming from the star to the amount of light that a 600 degree star should be putting out, they found the star was putting out twice as much light. The reason? It wasn't one star, but two -- identical twin brown dwarfs. Why are cool brown dwarfs so interesting? When the planet Jupiter formed, it was once much hotter than these stars. Over time, it has cooled down to a frigid -200 degrees Fahrenheit. By studying cool brown dwarfs, it is like we are looking at a young Jupiter, so we can learn what our Solar System was like many billions of years ago. Brown dwarfs also teach us about weather and chemistry, because the stars are cool enough that molecules like water and ammonia can form. Tools similar to those we use to study weather on Jupiter and the Earth predict what these brown dwarfs should look like as they cool; finding new cool brown dwarfs allow us to test these theories and models. Just like there are almost certainly hotter stars than KPD 0005+5106, there are almost certainly cooler brown dwarfs than these twins. They are so faint, these cool brown dwarfs could be hiding as close as just a few light-years away! Great article, Professor. I've included it in the AAVSO Writers Bureau for December/January.